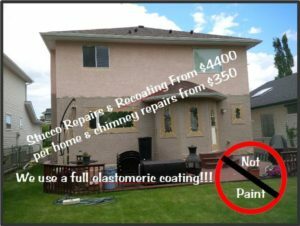 STUCCO COATING SPECIALS with Elastomeric – A high-build rubber coating that when professionally applied will last for years. It can hide hail damage, we repair any cracks and it is 1/3 the cost of replacement. An In-Home Colour Consult with Our Designer. Automatic Material Upgrade to a Full – Elastomeric. Up to 4 Exterior Lights (or an equivalent credit). Professional Application in a Timely Manner. Previous Previous post: Original 6 Million Colours Hacked By Computers!